Lieutenant Skat is a simplified two player version of the German game Skat. 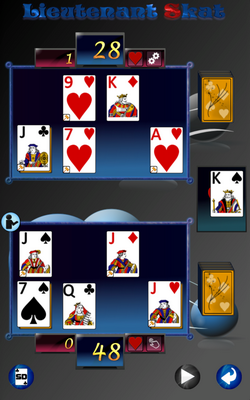 Two players play using 32 cards to score more than 60 points. A bonus is awarded for obtaining 90 even 120 points. In Skat all Jacks are always trump. Additonally one random suite can be trump too. 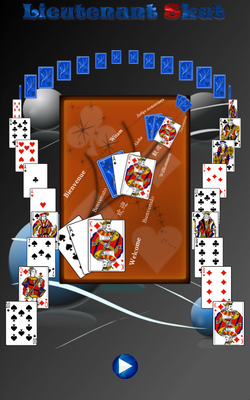 The card’s sequence is Jack of Clubs, Jack of Spades, Jack of Hearts, Jack of Diamons, Ace, Ten, King, Queen, 9, 8, 7. The suite of the first player must be followed. If the suite is not available a card can be thrown or a trump can be used to win the card. Otherwise the higher card wins. The winner of the two cards can play the next card.